Atlas Converting Equipment Ltd. is pleased to confirm that it has received an order for two Titan ER610 compact slitter rewinders from Dharampal Satyapal Group (DS Group) based in Noida, India for its flexible packaging operations located in Guwahati, in the State of Assam (NE India). DS Group will install the two new slitters in a purpose-built facility during September this year. Founded in 1929, DS Group is a rapidly expanding, diversified business conglomerate that has a strong presence in many sectors including food & beverages, hospitality, chewing tobacco, packaging, agro-forestry, rubber thread, power, sheet steel & cement. The most recent addition has been the Group’s foray into dairy and confectionery products and it now has 24 manufacturing sites located in various parts of the country, including New Delhi, Noida, Himachal Pradesh, Assam and Tripura. The new Titan ER610 slitter rewinders to be installed at DS Group will comprise one 1350mm and one 1650mm wide machine with an option of a maximum running speed at 550m/min. Rewind diameters can be up to 610mm with a minimum slit width of 35mm. The slitters will also be equipped with a static control system and edge trim extraction system. “Our flexible packaging operations have been doing well and expanding in recent years,” explained Mr. Bhuvnesh Gupta, Technical Director of Avichal Buildcon, a subsidiary of DS Group. “We installed a gravure printing press and laminator together with Titan SR8 slitter rewinders back in 2007, so we already knew how reliable and efficient the Titan equipment is. 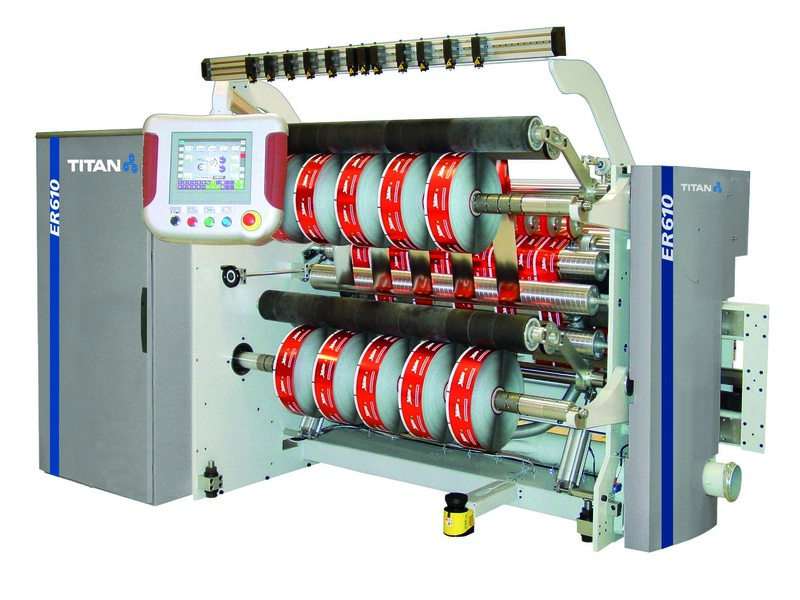 However, the new Titan ER610 model is more compact and is a perfect solution for our current production requirements of high quality flexibles. We are looking forward to further increasing our slitting capacity within the next few months,” he confirmed. DS Group’s flexible packaging plant in Assam has a production capacity of 3,600 tonnes per year and commenced operations in 2007 producing printed and laminated flexible packaging and pouches for a wide range of products including snack foods, shampoo and other consumer products. “We are delighted to have been selected again as the preferred supplier of slitting & rewinding solutions to the DS Group in India,” commented Barrie Homewood, Sales & Marketing Director for Titan products. “The continued confidence in Titan is a reflection of many of our customers who continue to repeat orders time and again,” he confirmed. The ER610 is available in two standard widths – 1350 & 1650mm and features a 10” touch screen control system. A pneumatically controlled braking system provides accurate web tension control and a digital edge-guide system controls lateral movement of the unwind reel to +/- 50 mm. Slitting systems available include shear knives, rotary razor (burst) or razor slitting in air or groove. Optional features include laser (line) core positioning, laser safety scanners and also a shaftless unwind roll pick-up from the floor. 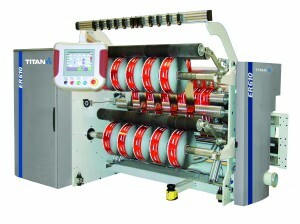 The Titan ER610 slitter can process a wide range of flexible materials including plain, printed, coated or metallized film from 20 to 350 micron, a wide range of laminates and paper from 20 to 200 gsm. It is a more environmentally friendly solution with reduced power consumption, no hydraulics for oil-free, hygienic operation, un-lubricated compressed air for zero oil/air emissions and less steel through its compact design. Its ‘one-piece’ construction also enables rapid installation and commissioning.